RIDE YOUR WAY Turn every ride into an exciting adventure. From the freedom of cruising the open road, to the thrill of leaning into the tightest curve on the highest peak, now you can create your own perfect adventure. 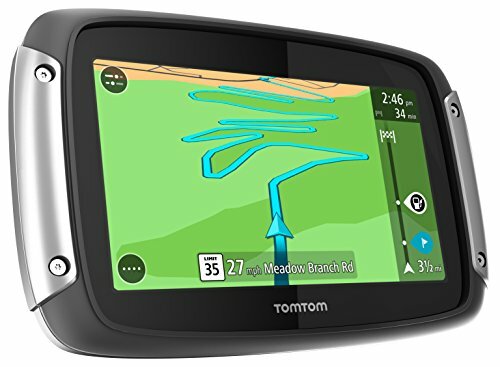 Winding Roads: Find the most exciting winding roads and avoid the boring straights with this TomTom navigation device designed for motorcycles. Hilly Roads: Stay at sea level or climb the highest peaks - the Rider 400 is weatherproof so you can enjoy your ride in rain or shine. Round-trip Planning: Discover new routes by simply tapping the area you want to explore and this motorcycle navigaition system will get you to and from your destination safely. Portrait View: The TomTom Motorcycle GPS mounts directly to your bike for easy visibility - simply rotate to portrait view to see more of the bends ahead and enjoy the ride. Lifetime TomTom Traffic and Maps: Always ride with real-time traffic information for the lifetime of the device and with the latest map.